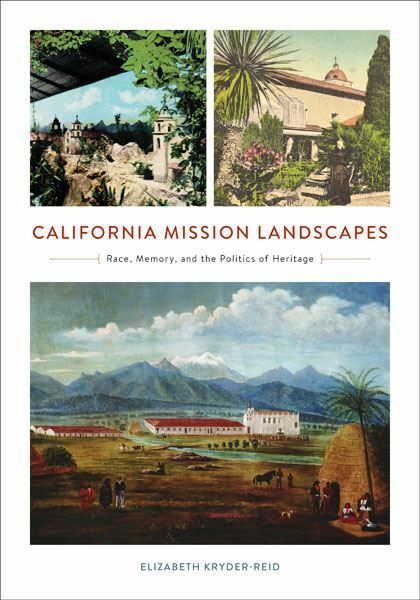 Elizabeth Kryder-Reid, California Mission Landscapes: Race, Memory, and the Politics of Heritage. University of Minnesota Press, 2016. The winner of the 2018 Abbott Lowell Cummings Prize for the publication that has made the most significant contribution to the study of vernacular architecture and cultural landscapes is Elizabeth Kryder-Reid, author of California Mission Landscapes: Race, Memory, and the Politics of Heritage. Although they have long been the focus of romantic conceptions of California life before the U.S. conquest, California’s missions are among the least known of American historic sites. Kryder-Reid begins by evoking that nostalgic vision of mission life, but quickly introduces us to the brutality of that life for indigenous Californians. Through an astute examination of physical remains, spatial practices, visual images, documentary sources, and even contemporary art works, she depicts the missions as complexes of living and working, as well as religious, spaces. Kryder-Reid then deftly demonstrates the process by which these landscapes of colonialism and conversion were transformed in the memories of Anglo Californians in a land of indolent leisure, a vision that has only recently been challenged by descendants of indigenous Californians and Latino Californios. emphasizes fieldwork that takes seriously the materiality of architecture and landscapes, and draws on particular elements of environments as evidence. contributes generally to the intellectual vitality of vernacular studies in North America. Entries may come from any discipline concerned with vernacular architecture studies. Books published from January 2017 through December 2018 are eligible for consideration. Edited collections of previously published materials are not eligible. The deadline for the 2019 Cummings Prize is December 15, 2018.